Bose is known for its high-quality headphones and speakers, but the company is diving into wearables with Frames. At first glance, Frames are a simple pair of sunglasses, but hidden in the chunky frames you'll find a microphone and speaker. 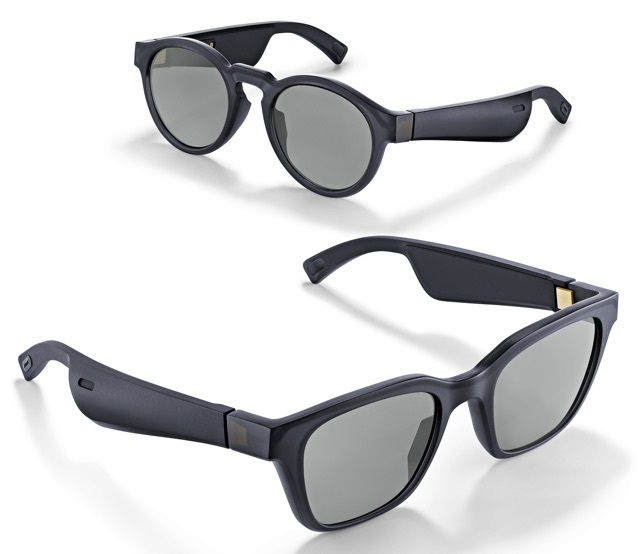 That makes Frames a pair of sunglasses that can wirelessly play music, take phone calls, and even use Siri or Google Assistant. They have all the features you would expect from a pair of wireless headphones — they're just built into a pair of sunglasses. As far as style, Frames are pretty basic. The frames themselves are black with black-tinted lenses that block 99% of UVA and UVB rays, and have either a rounded or angular shape. It's a classic sunglasses look is ideal for an everyday wearable that you'll want to use regardless of your wardrobe. They have a bit more bulk than the standard sunglasses, with arms that are wider than usual, but it doesn't add too much weight: they're only 45 grams. That's a little heavier than your average sunglasses, but not so much that it will bother you. This isn't the first time that a company has combined headphones with sunglasses. Kickstarter startup Zungle makes bone conduction headphones built into sunglasses, which look very similar to Bose Frames. But instead of using bone conduction, Bose uses its own open-ear speaker design that makes Frames as thin as possible. This should allow ambient noise in, which is good for staying aware of your surroundings, an important safety feature if you're walking down a busy street. However, this also means you won't have the pitch-perfect sound you get from Bose's QuietComfort noise-canceling headphones. Frames have a fair 3.5-hour battery life for listening (and last 12 hours on standby), which is comparable to the best true-wireless headphones on the market. Since you won't want to wear these tinted frames while you're at your desk, that's probably all you need for everyday use. But Bose has plans beyond just a pair of headphones attached to sunglasses: they're also an augmented reality device. Instead of turning the lenses into screens, Bose's augmented reality is all audio. Bose AR uses your smartphone's GPS to determine your location, and a motion sensor in the sunglasses themselves can tell which direction you're facing to provide contextual information. There aren't many details on what AR features will be offered, but they would be perfect for navigation or tour guide style narration when you're traveling. These AR features won't be available at launch, but Bose plans to announce details in March 2019. Bose Frames are available for pre-order for $199 from Bose, and they'll ship in January.